· It has been DJE’s mission to enable a transformation of the Tanzanian music industry, and its support infrastructure, to a global-standard. Subsequent years post-DJE show strong evidence of heightened skills and craftsmanship throughout the Artistic and Technical sub-sectors especially, an outcome which in part testifies to the impact of the Dar Jazz Event. · The opportunity to connect and interact with Dar Jazz Event’s team of top, internationally-active jazz musicians truly serves to benefit and inspire established local professional musicians as well as young, talented Tanzanian musicians who aspire to careers in music that may bring them beyond the borders of their country. 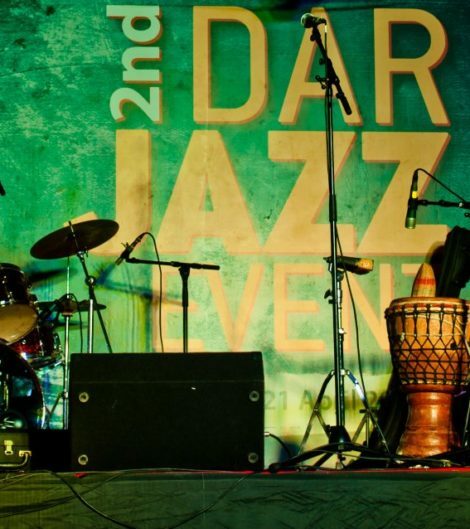 · The Dar Jazz Event has attracted audience participation from as far away as Mwanza, Arusha, and Zanzibar, thereby serving a wide cross-section of the Tanzanian population. · The DJE team is left with the impression that the Dar Jazz Event has served to empower and inspire Tanzanian artists and musicians to attain a higher level of musicianship, with the infusion of Jazz elements enabling even stronger appeal for Tanzanian music within the global music market. · The infusion of African-American Jazz with Tanzanian Bongo Flava has inspired a creative trend which local musicians continue to explore, even after the conclusion of The Dar Jazz Event. Kutoka Watu wa Marekani · Sumaria Group Ltd. · Hotel Sea Cliff · Hennessy · Choice FM · Coral Beach Hotel · Advertising Dar · Hugo Domingo · Alliance Francaise · Tanzania House of Talent · TLR Eclectic · French Kiss Event Management · Third Wave | MBI · Watersign Media · Wave Media Group Ltd.
Powered by Wave Media Group. | © 2010-2020 by Dar Jazz Event, a not for profit entity.